Its a quick and luxurious way to refresh and change the appearance of a bathroom, power room, restroom, master bathroom, kids bathroom, guest suite or hotel bath without a big expense. Our unique & modern designs match well with various color palettes of towels, rugs, bathroom mats and any other bathroom accessories. High resolution pictures bring a 3D like realistic experience to your life. Colors won't fade thanks to new digital printing methods. It's not too thin or too thick. Adds real value and depth to your decor. They're waterproof and dry fast after you shower. A perfect gift idea for your mom, dad, sister, brother, grandma, grandpa, wife, husband, son, daughter and all other beloved ones with 10's of thousands of surprising designs. A bathroom is where you spend a considerable part of your day, it's a place to relax so enter a new world by having our shower curtains. Can be at the seashore, can feel ocean waves or meditate while staring at mountain landscapes. If you are a fan of sports or have a hobby of any kind, you will be spending time with it in your own personal space. As manufacturers of digital printed home textiles, we follow current trends and bring you the latest home fashion. Either a gift to your family or friend, parents, grandparents, relative, boyfriend, girlfriend, or to yourself, the item should be interesting and authentic. Men, women, kids, teens, boys or girls will love this item. 1.Due to manual measurement, please kindly allow 1-2 cm discrepancy. 2.The digital images we display have the most accurate color possible but due to differences in pc monitors, we can't be responsible for variations in color between the actual product and your screen. Strong and Durable: Made of 100% Polyester Fabric. Waterproof polyester fabric, fine degree of detail,tough durable fabric, allows for easy cleaning. This material makes it very durable and it can last for many years. Fitted with golden hooks, has 12 holes to which rings attach. Machine washable, Do not bleach or tumble dry. Great for home, apartments, dorms, hotels, campers, school showers, athletic club showers and more! Non Toxic, Eco-Friendly, No Chemical Odor,Environmentally friendly. ANTIBACTERIAL, MOLD & MILDEW RESISTANT: Odorless, Mold & Mildew Resistant, Antibacterial, Chlorine-Free,provides protection against mildew or mold build up; inhibits bacteria growth. RUST PROOF GROMMETS - Keep your shower liner looking new all the time and protect against the humidity in the bathroom. 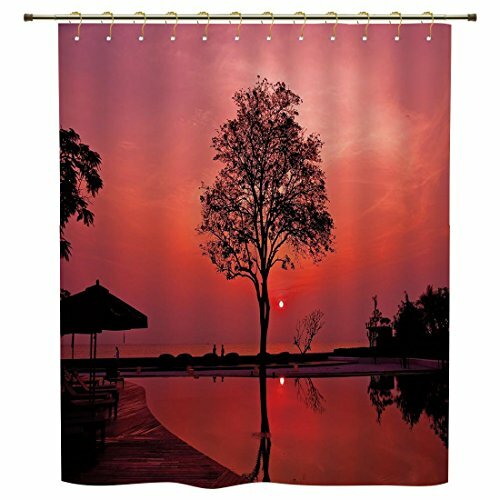 You can get your special shower curtain by using your favorite photos, images or text, and you will enjoy it during taking shower.